The year is 1854 and William Howard Russell is writing for The Times of London about some 600 British soldiers who, through a tragedy of failed communication by their own military commanders, rushed headlong into a deadly assault of Russian artillery fire during the Crimean War. “If the exhibition of the most brilliant valour, of the excess of courage, and of a daring which would have reflected lustre on the best days of chivalry can afford full consolation for the disaster of today, we can have no reason to regret the melancholy loss which we sustained in a contest with a savage and barbarian enemy,” Russell wrote in a piece called The Charge of the Light Brigade in what was one of the first instances of embedded journalism in history. “Never did the painter’s eye rest on a more beautiful scene than I beheld from the ridge,” Russell continued, writing about the action at Balaklava in Crimea, site of the suicidal charge of the Light Brigade. Russell was positioned at a safe vantage point from which he could survey the action, as later became common for war reporters who’d sit with generals on hilltops to get a privileged view of war, one from the perspective of a military commander. On 16 August, striking miners were gathered in their thousands on a hill at Lonmin mine at Marikana. Razor wire was laid by heavily armed police. Tensions ran high. Behind the police, in the safety of their arc, local media were covering what would become the bloodiest faceoff between law enforcement and protestors since the death of Apartheid. “What is emerging in the public domain is a hierarchy of views about what actually happened on that day. The one version of events—which seems to be the version borne out by the television and most journalist accounts, particularly the Sunday papers—effectively points to the striking workers having precipitated the fatal shooting by effectively firing on the police first,” said Jane Duncan, Highway Africa Chair of Media and Information Society at Rhodes University’s School of Journalism and Media Studies. Duncan said what is emerging in South Africa’s post-Marikana public discourse is a contestation for the hierarchy of perspectives about what really happened on Lonmin’s mine on that fateful Thursday. “What is coming out from the alternative account (see Marikana: What really happened, we may never know) is that it may not have been the case that that a group of workers actually charged on the police. What may well have happened is that police shot on striking workers from behind (and out of sight of the media) which forced the workers to run towards the police,” said Duncan. If this is ever proven accurate, what it suggests is that Lonmin’s striking miners were not attacking police but were effectively fleeing from them. “If there were workers who were armed in that circumstance it is hardly surprising that they would have drawn a fire arm and fired on the police. I am not saying that to condone the behaviour, but it would be a logical consequence if the workers were attacked by the police from behind,” she added. The usual suspects, the dominant sources that journalists use, according to Duncan, are the official voices of the police, government or unions. These “legitimised” sources tend to recognised by media as providing credible and reliable information. “Whether these sources are credible or reliable is another point of view,” Duncan said. Duncan maintains that research work by Peter Alexander, a University of Johannesburg professor, at Marikana has exposed an alternative account of what happened at the mine. This is also borne out by Daily Maverick’s report of workers’ addresses during an inter-ministerial meeting in the aftermath of the massacre. Duncan said Alexander’s work has put journalists “to shame”. By gathering accounts of the event that challenge mainstream reporting, Alexander has expanded on the “inevitable” narrative created by journalists safely behind police lines that police were acting in self defence. Alexander’s research pointed to what he has called a “premeditated police plan” that resulted in strikers fleeing law enforcement officers and being drawn like lambs to the slaughter. What also needs to heard, and what Duncan said the media has largely been deaf to, is the miners’ frustration and sense of betrayal by the media. “The miners are feeling that their version of events has not been sufficiently canvassed, and because of that they are starting to accuse media organisations of being complicit in the attempts to cover up the full extent of the police violence,” she said. This could have long-term implications for newsgathering. “If workers in conflict with the police and with managers come to develop this perception that journalists are running an agenda for the status quo, it is going to be very difficult for those journalists to get the information they need in order to paint a balanced and picture. It may also end up escalating hostility towards journalists, which could be dangerous for journalists in violent situations,” Duncan concluded. “Half a league, half a league, half a league onward…” Just as Russell was capturing a battle that would become a metaphor for the death of blind chivalry in the face of modern warfare (so exactingly captured in Alfred Tennyson’s poem), the media is witnessing a schism in South Africa. Marikana isn’t a mere event. It is a moment in history, with all the gravitas that’s implied in that statement. 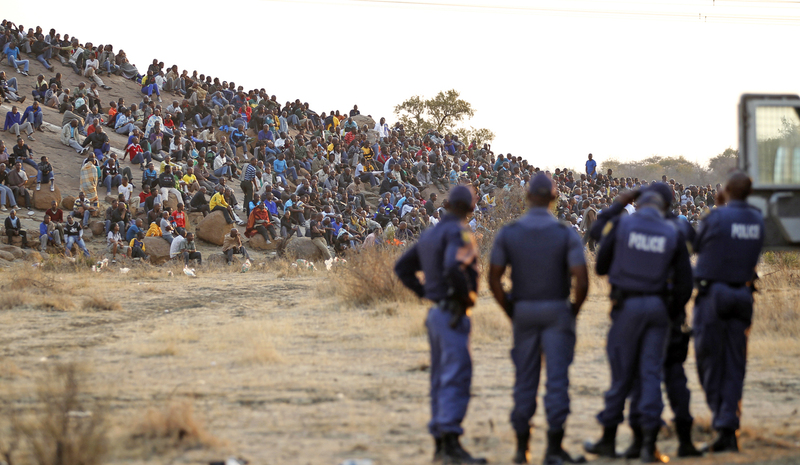 Marikana: What really happened? We may never know at Daily Maverick.